German carmaker Mercedes-Benz has unveiled its first fully-electric SUV, in a bid to take on US rival Tesla. The subsidiary of Daimler says the EQC, which has two electric motors, will have a range of more than 450km. It will start rolling off production lines at the Mercedes-Benz plant in Bremen in 2019. The firm is investing more than €10bn (£9bn) in the expansion of its electric range, and more than €1bn in battery production. 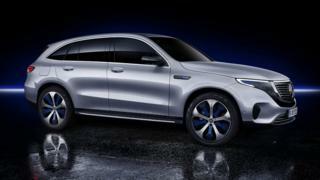 The new SUV is the first model in a range of ten EQ cars that Mercedes plans to launch by 2022. With bans on combustion engines looming in the UK and France, and the establishment of a low-emission zones in cities across Europe, major car firms have been scrambling to enter the electric vehicle market. Until recently, the California-based Tesla, which is struggling to meet production targets and burning through cash, had little competition. Now, German brands Porsche and Audi are scheduled to produce luxury electric cars, as is Britain's Jaguar. Earlier this year, the German government ordered Daimler to recall 238,000 vehicles in Germany after they were found to be fitted with illegal software that masks diesel emissions. Across Europe a total of 774,000 diesel vehicles contain "defeat devices" and Daimler said it would recall them all. It said it would refit software but denied any wrongdoing.